As many know who read this blog regularly, I’m a bit of an overdrive/distortion pedal nut. Just love the things. Silicon, germanium, doesn’t matter. I’ve always dug the tones boxes like the Fulltone OCD and Ibanez TS-808 produce. But then again, I never had good enough tube amps whose natural distortion didn’t require some bolstering. Then I discovered Reason Amps, and did a review of the Reason SM25, which the guys at Reason graciously sent me to evaluate and to show to some local dealers. For the first time in my playing career, I’ve been playing an amp that has a knock-your-socks-off natural distortion. It’s so pleasing that I just don’t need overdrive or distortion pedals to get that saturated sound. It’s in the amp! But the one thing that I found that I missed when playing with the amp at a couple of recent gigs was the volume boost I’d set up in my drive pedals to play a lead. It wasn’t that big a deal; I just set up the base volume of the amp a little louder than normal, then use the volume knob on my guitar. And for most situations that has worked out well. But when the band gets really loud, I need some extra oomph, and that’s when I started thinking that a booster pedal would really help. Flat EQ response, and a single volume knob? What could be easier? I know there are lots of booster pedals out there. But from my research, it seems that most add some coloration of their own, or have an extra “drive” knob to add overdrive. From my perspective, a booster should just well, boost; that is, take what you have and just give you more of it. And from what Anthony has said, and from the reviews I’ve read, this seems like it does just that. If this is enough for you to take a bit, you can only get the pedal at Creation Audio Labs directly. But don’t dispair! 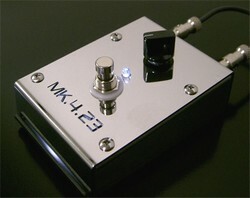 This pedal is only $149.00!!! Can you believe it?!!! Creation Audio Labs want to reach as many people as possible, so they eliminated the middle man and sell their pedals direct. So what used to be $250+ pedal is over a hundred bucks cheaper! I think those pedals are definitely worth a look for price alone! Creation Audio Labs has been known as a great boutique pedal maker, and to have them get into the range of more affordable pedals is absolutely awesome! Check ’em out!